Three decades after the widespread political crisis that affected Europe after the Second World War, Spain abandoned its isolation and joined firmly the European project. 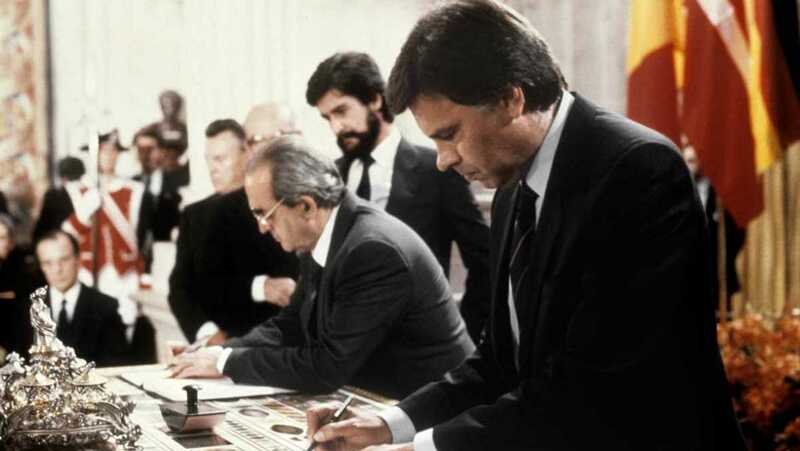 After 1975, the future of Spain was inextricably linked to the successful experience of economic progress and democracy pursued by its European partners. Yet what happens when the EU seems nowadays anything but a success? Is Europe no longer a model for Spain, nor the solution to its domestic problems? Social scientists are providing some inspiring ideas for reflection on Spain’s past, present, and future role in Europe. In one of his most politically engaged films, The Spirit of ‘45 (2013), the British director Ken Loach describes the general consensus towards a new “social contract” that spread all over Europe after World War II. Focusing on the case of the United Kingdom, Loach shows how the British society joined efforts in an attempt to create a common project on the ruins of the European civilisation, while the memories of the debacle experienced after the Great War (1914-1918) still loomed over. This idealistic, democratic, and peaceful sense of community gave momentum to the two biggest creations in recent European history: the welfare state and the European Union. Just when Loach sets the twilight of this experiment in England, namely after the Thatcher revolution in the seventies, Spain was influenced by its own “spirit of ‘45” during the Transition to democracy. Between 1975 and 1986, after almost 40 years without fundamental freedoms under the dictatorship of Francisco Franco (1939-1975), Spain went through the same comprehensive state reform that the main Western European countries experienced thirty years before. In general terms, the Spanish society supported this exciting, idealistic, and democratic project. The result of all this was encapsulated in the Spanish Constitution of 1978. What sometimes goes unnoticed in the discussion on this crucial period of the recent Spanish history —and what did really make this scenario historic— is the fact that the national democratic project developed in Spain was based primarily on the convergence with Europe. Since the late seventies, almost all political forces represented in the Parliament pursued the reconstruction of Spanish identity by re-appropriating it in a democratic way, forgetting the recent authoritarian past, and assuming the European project and culture as their own. No matter how much national sovereignty had to be transferred to the European institutions, no matter how strong the nationalistic sentiments in the Basque Country or Catalonia were —as the famous Spanish philosopher José Ortega y Gasset once said, “Spain is the problem, Europe is the solution.” The Spanish entry into the European Economic Community in 1986 seemed to be an outstanding opportunity for Madrid in order to overcome an endemic history full of social divisions, civil wars, and economic turmoil. So, since 1975, the Spanish domestic project was linked closely not only with the adoption of the welfare state at the domestic level, but also with the successful European economic and democratic process. Thus, when this process is suffering a deep crisis, as it has been the case since 2008, what might be the consequences for Spain? Provided the close relationship between the founding pillars of a democratic Spain and the European project, does a retreat from integration processes in Europe mean the end of the Spanish state as we know it today? Further unsettling questions strike us: if the history of Europe since 1945 is no longer to be interpreted only as a resounding success, how should we reinterpret the Spanish nation? Could the overall crisis that affected Spain since 2008 —let us say affects— find its deeper explanation at the European level? May the current independence process in Catalonia be understood as the last step of a greater Spanish disenchantment towards Europe, as a definitive disappointing epilog of the pro-European “spirit of ‘75”? Simple solutions to such big problems are not easy to be found. However, regardless of how apocalyptic this overview may seem, there is —there should be— always room for optimism. In order to start seeing light at the end of the tunnel, some Spanish social scientists have transformed the previous questions into the starting point for a renewed research agenda. For instance, political science believes now that it is time for Spain to tackle its own identitarian problems immediately, both at a national and a regional level, so that the political challenge in Catalonia and especially the social breakdown among Spaniards and Catalonians does not increase even further. At this respect, Europe is not going to provide solutions any more. Moreover, some experts consider the existing circumstances conducive enough for Spain to make the leap to the heart of Europe, since the worst days of the economic crisis are gladly far away. Furthermore, historians are suggesting that on the grounds of our uncertain times it is neither the present nor the future, but our knowledge over the past that needs critical reassessment. A few historians criticise the “spirit of ‘75” and its eagerness to forget —instead of condemning publicly— the implications of the Franco dictatorship, which concentrated on recovering the memory of the victims. Regarding the European influence on the Spanish Transition, the initial question is quite different: was the Spanish convergence with Europe an elitist phenomenon, distanced from a popular awareness and its real day-to-day implications for society? This key question leads to more gaps than expected in the field of Europeanization of Spanish society. As in many other countries, for a long time Spanish historians took the European success for granted, adapting it to the Spanish historical aspirations towards Europe, but failed to make us comprehend the controversial European history of Spain since 1975. The discursive task ahead is demanding, but equally inspiring. Only by thinking critically about the history of Europe can a new generation of Spanish citizens be more pro-European than its founders. Only in this way can the “spirit of ‘75” move an entire country as it once did. Antonio Moreno Juste: Les Communautés Européennes e la Politique extérieure espagnole dans le contexte de la Transition démocratique. Revue d’ Histoire Diplomatique 2.2 (2014), 141-156. José Ignacio Torreblanca: Del aislamiento a la plena integración. El País (2017). In: https://politica.elpais.com/politica/2017/06/09/actualidad/1497021035_084365.html (8 Sep 2017).